ABB will deliver electric, digital and connected solutions for one of the first superyachts built to meet strict new emissions standards. The 80-meter superyacht, built at the Nobiskrug shipyard in Germany, will feature a wide scope of ABB’s technologies that will enhance its environmental performance and help the vessel comply with the International Maritime Organization’s new “Tier III” regulations. The new regulation comes into force for all superyachts from 2021 onwards and requires nitrogen oxide (NOx) emissions to be 70 percent lower than those permitted under current limits. “We prioritized passenger comfort and energy efficiency at an early stage and we believe the solution offered by Nobiskrug and ABB will achieve these goals,” says Captain Aaron T. Clark. The superyacht will be powered by two compact gearless steerable Azipod® C propulsion units with the proven ability to consume 20 percent less fuel than traditional shaftline propulsion systems. Azipod® propulsion extends below the vessel’s hull freeing valuable onboard space. Due to its minimal noise and vibration, ABB’s propulsion system increases passenger and crew comfort, while 360-degree rotation of the units provides high maneuverability. ABB’s award-winning power and distribution system Onboard DC Grid™ will help the superyacht achieve additional efficiency by allowing the engines to work at variable speeds and draw on stored energy. Onboard DC Grid™, which had cut fuel consumption by 27% in other applications, is also suitable for integration of next-generation energy sources, including renewables. The vessel will also feature ABB’s integrated Power and Energy Management System (PEMS) autonomously controlling load sharing between energy sources. “ABB was chosen because of its vast experience in the passenger vessel field and global service network. We are convinced of the many benefits of Onboard DC Grid™, Azipod® propulsion and life-long support for this advanced technology yacht,” says Holger Kahl, Managing Director, Nobiskrug. In line with ABB’s “Electric. Digital. 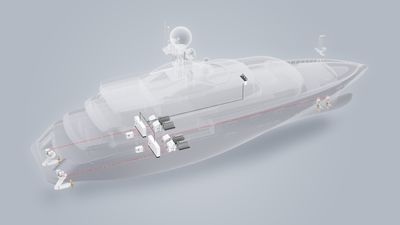 Connected.” vision for seagoing vessels, the superyacht will have the capability to connect to the ABB Ability™ Collaborative Operations Centers infrastructure. This network uses remote equipment monitoring and data analytics to enable predictive maintenance, planned interventions or even remote technical support.